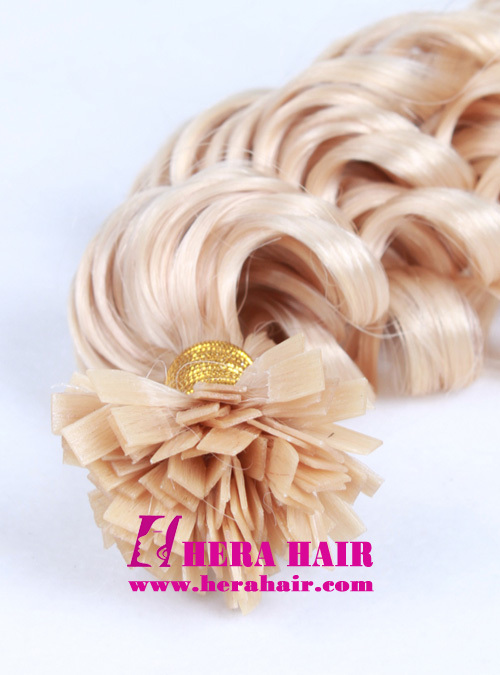 This fusion hair extensions is Hera's screw curl custom blonde color Malaysian virgin Flat tip fusion hair extensions, which we copy customer's own hair color according to their hair sample. Hera not only wholesale fusion hair extensions to hair salons, hair retailers and hair wholesaler, we also retail fusion hair extensions to direct personal buyer and custom color according to customer's special requirement. Hera's color swatch has most popular hair color, so normally speaking, we recommend customers to pick up color from our color chart. But some customers need more precise color so they want us custom color for them. We have to point out that custom color's cost is very high, which you should send the hair sample to us and we will charge extra custom color fee than our regular color. Because the color chart is little different with real color swatch, so if you want more correct color, we recommend you buy one set Hera's virgin hair color chart, especial for hair salons, hair wholesaler and hair retailers. About the fusion hair extensions' hair materials, now we mainly sell virgin hair, which virgin hair quality is very good and could last longer time, such as Malaysian virgin fusion hair extensions, Brazilian virgin fusion hair extensions, European virgin fusion hair extensions all are good choice. About the fusion hair extensions' tip, we not only do flat tip, also can do i-tip, v-tip, u-tip etc. If you can describe the tip clearly, we can do that for you. Personal buyer for Malaysian fusion hair extensions, you can visit our online hair shop through main menu. Any more question about Malaysian fusion hair extensions, please feel free to contact us by email or leave message though contact page's form, we will reply you within 24 hours.